Complex carbohydrates are good for blood sugar control. 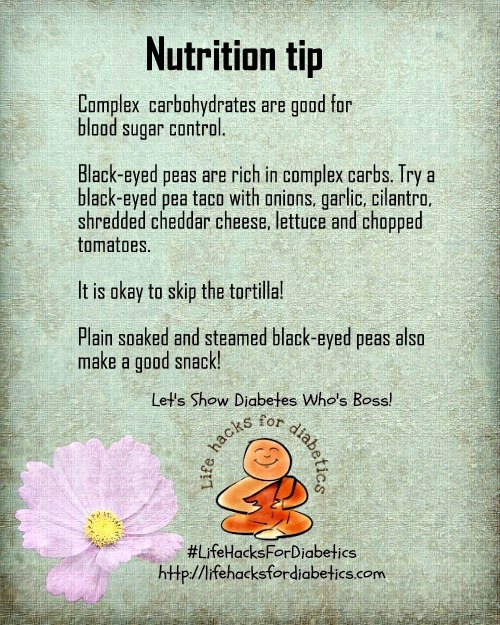 Black-eyed peas are rich in complex carbs. Try a black-eyed pea taco with onions, garlic, cilantro, shredded cheddar cheese, lettuce and chopped tomatoes. It is okay to skip the tortilla! Plain soaked and steamed black-eyed peas also make a good snack! More about the diabetes diet here. I grew up with a dad who has type 1 diabetes so we’re very careful with our diet! Great post. Hey Stephen! Thanks! 🙂 This is my third year with the A to Z and I am participating with three blogs this year – and loving it! So glad you came by!